Featured in the photo are 80 care packages delivered to Dane County Department of Human Services. Thank you to all our supporters who make such deliveries possible! 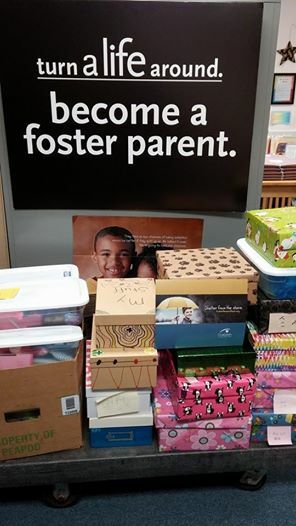 Project Shoe Box has been successfully providing enough care packages for every child entering out of home care in Milwaukee County since shortly after our creation in summer 2012. We are excited to announce we have grown and are now going to be meeting the needs of additional counties. We have already delivered approximately 200 care packages to child welfare agencies in Waukesha and Kenosha County. Thank you again to our fantastic supporters that make it possible for us to provide care packages for this special population of children! Pictured are Madi Prange, Foster Care Licensing Social Worker, and Chelsey Nisbet, Permanency Services Social Worker, from Waukesha County that excitedly coordinated and accepted the PSB donation in Waukesha County. Thank you to the children at St. Joseph's Sunday School in Garfton, WI for wrapping and packing shoe boxes. The care packages rocked! The employees at Empathia came together again for their 2nd Annual Shoe Box Drive. Thank you Empathia for another successful drive! Empathia's continuous support is greatly appreciated. An extra shout out to Kelly Parbs for coordinating the drive. Project Shoe Box (PSB) has grown significantly since starting in summer 2012, exclusively because of the overwhelming support from the community. We feel like we cannot say thank you enough for the support and everything that has been done to help us fufill our mission which truly makes a difference during a difficult time in a vulnerable child's life. The unexpected success has resulted in PSB outgrowing our space! We are looking for a space an organization or agency might be able to donate. We need a small storage area that is large enough to both store donations, sort donations, and package care packaages. The location needs to be locked to ensure donations are secure and the space needs to on occasion be accessible to volunteers. Centrally located in Milwaukee County would be ideal.